Narrator Max “Crusher” McNash is the hard-boiled ace police detective in the Kennels’ Slaughter Unit, “a barrel-chested bull terrier with a biscuit-thin temper and a barbed-wire tongue.” When he is called at home at almost midnight to investigate the gruesome murder of two well-known Rottweiler enforcers at a wharfside slum, he figures that it is just the result of another gang war between canine hoodlums. That’s the Feline Bureau of Investigation. The FBI special agent turns out to be Cassius Lap, a Siamese. Crusher HATES Siamese. A historical digression explains that Crusher, in his youth, served with the United Breeds troops in the Siamese war against the North Siamese, and was captured and spent months in a North Siamese P.O.W. bamboo cage. Crusher is both infuriated and humiliated to become the junior partner with the supercilious Lap. They become a really Odd Couple team. But Crusher is reluctantly impressed when clues lead them out of the Kennels and into the feline heights of Kathattan, and Lap’s smooth presence wins them cooperation that the roughshod bull terrier could never have gotten on his own. All of the clever references do not get in the way of the serious murder investigation (despite ending the climax with a really horrible pun). 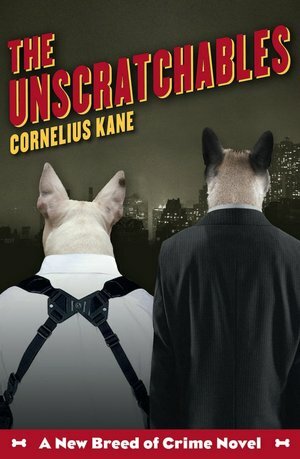 For Furry fans who enjoy a good whodunit, The Unscratchables is an enjoyable read. Cornelius Kane is a pseudonym. The novel is copyrighted in the name of Anthony O’Neill. There is a 373-page hardcover Large Print edition from Thorndike Press for $30.95. I don't think I'll care for the story. It sounds like it's trying too hard to be funny. It's also got one ugly cover. Oh my god, the puns, the horrible, horrible puns. As much as I love gritty crime novels I think I'll have to give this one a pass. Also Goodboy was a cat's-paw? Wow, now that's an oblique reference if I've ever heard one. I get that he's going for a theme with his writing, but a cat's-paw is usually a euphemism for someone who's being used as a political sacrifice, and using it as a possible throw away gag, that's just trying way too hard to be funny. I think I'll go watch some old episodes of Jim Henson's Dog City, or reread Anonymous Rex. They might not be considered classics to some, but at least the thought of Vincent Rubio, dinosaur detective, tripping out on a bad batch of basil will always make me laugh. The implication is that President Goodboy, a dog, is a stooge for the feline political bosses and fat-cat magnates who really run San Bernardo. If it's obvious to everybody, he could be described as a cat's-paw. I am reminded of late 19th-century Republican boss Senator Roscoe Conkling (R-NY), who didn't want to become president himself; he wanted to become known throughout America as the wheeler-dealer who got presidents elected. So, of course, all his enemies lined up to support anybody-besides-Conkling's-candidates. (See the 1880 Republican convention in particular.) Conkling's candidates could be called cat's-paws for his obvious political interests.